Tourist information and guide to diving and diving locations in Santa Ponsa, Majorca, Spain. Scuba diving in Santa Ponsa is one of the popular water sports activities in Santa Ponsa. The water temperature, beautiful underwater environment and crystal clear waters of Mallorca allow scuba diving lovers (both beginners and proffessionals) have a great diving experience on their Santa Ponsa holidays. As for scuba diving in Santa Ponsa, there is a scuba diving school, Zoea Mallorca, located on the south west resort of Santa Ponsa, at the marina of Club Nautico. 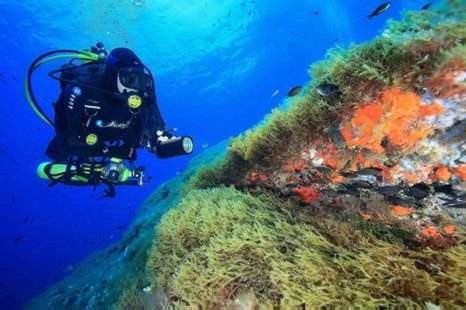 In addition; Majorca also offers great scuba diving opportunities along its great diving spots. Below you may read the popular ones.